Here is the eighth of my top 10 Thailand golf courses. One of the world’s great golf designers, Robert Trent Jones Jr, designed Santiburi Country Club, 7km from Chiang Rai in northern Thailand. One of five courses in his Thai portfolio, it is also his best. Established in 1992, Santiburi Chiang Rai presents a memorable golf experience. As Chiang Rai’s first golf course, it is the top course in the region known as The Golden Triangle. The cool morning air in winter makes an idea time to experience the course when the first few holes are often shrouded in a light fog that seems to form a blanket of white. The golf course is championship caliper, yet it is playable and enjoyable for golfers on every skill level. Set into the contours of a valley, it offers a superbly landscaped golf course that meanders beneath a canopy of mature shade trees, plays around several lakes and streams, and has spectacular views of the lush green foothills and mountains of Chiang Rai in the distance. A relatively flat outward nine, with five holes from the second to the sixth playing around a large lake, changes character to a hilly inward nine with long fairways and water only on the last two holes. The back nine holes are routed through steep valleys and a chain of 3 lakes. Playing a comfortable 6982 yards from the back tees and 6435 yards from the middle tees, the Bermuda fairways and greens are a delight to play on a course that demonstrates why Robert Trent Jones Jr is so highly regarded as a golf course architect. 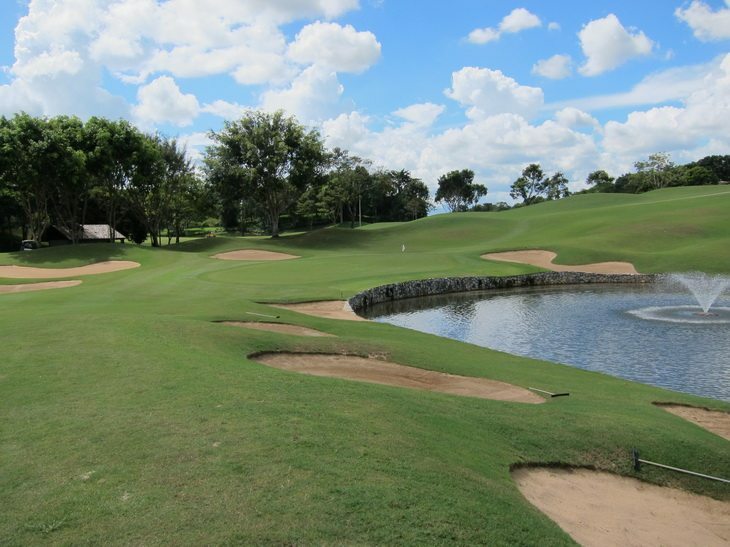 The Santiburi Chiang Rai course is kept in excellent condition year round. If you are coming to Thailand, like to golf, and part of your time will be spent in Chiang Mai or Chiang Rai, then you should really make time to play this fantastic course.